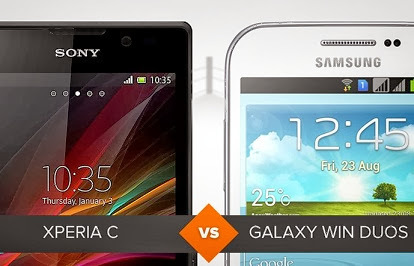 Xperia C or Galaxy Duos Win - Which One To Choose? The Xperia has a C GHz Cortex-A7, 1 GB of RAM and 4 GB internal memory quad-core processor with 1.2 slot for microSD cards up to 32 GB. Moreover, the phone is equipped with Sony's 2,390 mAh battery, Wi-Fi connectivity, 3G, Bluetooth, FM radio and compatibility with two chips. The Galaxy is not much different. Its processor is a Snapdragon 200 quad-core 1.2 GHz with 1 GB of RAM. The internal memory however is greater: 8 GB (with the same slot for 32 GB cards). It is also dual-chip, has Bluetooth, Wi-Fi and 3G, but with a weaker battery: 2,000 mAh. Very few differences between these two devices. Xperia has more battery power and the Galaxy has more internal memory. Directly, which most affects the performance of the phone itself is the space for storage. Therefore, there is a slight advantage to the Samsung product in this regard. The display of the Xperia C is bigger and better. It measures 5 inches and has a resolution of 540 x 960 pixels with a density of approximately 220 ppi. The Galaxy Win with even the smallest, can not have such a good quality. It measures 4.66 inches with a resolution of 480 x 800 pixels, generating a density 199 ppi. So, for those seeking a more portable alternative, the handset from Samsung is the best option. The gadget from Sony is stockier and has a larger screen. Visually, it is even more beautiful. However, the footprint on the Galaxy Duos Win is better for the hands, and the smaller size is more enjoyable overall. The cameras of the last members of the Sony Xperia line usually very good, and it remains so in the Xperia C. It has 8 megapixel rear camera with a feature footage in 1080p. On the front, only VGA. Have to Win the Galaxy Duos is a bit disappointing because it does not have the quality of the tops of the Galaxy line. The rear engine for royalty, it is even reasonable with 5 megapixels. But the recording is well below the level in the Xperia C, with filming only in 480p. Its front camera is similar to your competitor, with VGA resolution. Both have, in the rear engine, geolocation, touch focus and face and smile detection. Both have Android Jelly Bean, with the only difference that the Xperia C have version 4.2.2 Duos and Galaxy Win to 4.2.1. Also changes the interface - with the handset from Sony, of course, is the Xperia UI, while the Samsung's TouchWiz, and installed applications, which vary according to manufacturer. According to a search on shopping sites, Galaxy Win Duos takes wide lead on price. After all, can be found for less than US $ 400 in the market. The Xperia C costs US $ 100 more, coming for less than US $ 500. So the smart Samsung is the best option. The conclusion is based on the comparative cost-benefit issue. The Win Duos costs US $ 100 less than the Xperia C, and has no specifications as well as lower the features offered by phone from Sony. Inclusive, is slightly higher in performance issue. True, it has a screen with a little less quality, and a powerful little camera, but for those who just want an intermediary device with a low price, no doubt it can "break a twig" well. The Xperia C is better in one issue or another, but it costs a lot more expensive. For those who do not care about value and can spend a little more, the handset from Sony seems a superior alternative. In basic, which is dual-chip, a large screen Android system, Internet access and compatibility with applications and games, the two are very similar.